Any other time, the rain twinkling like Christmas lights across the windshield would have enchanted me. Now, as we rode uptown toward Manhattan’s Columbia University, the image warned of trouble. Ten of us had crammed into Frisner’s green mini-van for a gig at the University. Numbering fifteen in all, we needed another vehicle, so drummer and flutist Luc Richard offered to take four others in his car. I had given Frisner a copy of the program, which named the venue—the International Affairs Building (IAB)—and I assumed he’d passed the information on to Richard. Never assume! I just learned that Richard’s only instruction was to follow us. All he knew about the venue was “Columbia University.” I thought about the Morningside Campus, whose four-dozen or so buildings occupy more than six city blocks, and I thought about the blur of the streetscape seen through wet glass. What if Richard loses us? The mobile phone was science fiction in 1983. If only we could stop the rain. If only we had that one Haitian worm! Let’s back up a bit and put the story in context. The International Council for Traditional Music (ICTM), which met all over the world, was holding its Twenty-Seventh Conference in New York City, August 8-15, 1983. Hunter College CUNY and Columbia University co-hosted the conference, and IAB on the Columbia Morningside Campus served as venue. A student of the ethnomusicology program at Hunter College, I was on the student team helping out, but I’d also worked up the nerve to propose a paper for presentation—and it was accepted! Columbia professor Phil Schuyler (one of my mentors later on) noted that I would speak about Vodou music and dance in a theatrical setting. As the person responsible for conference entertainment, and as someone who had seen the Troupe stage a Vodou dance, Phil negotiated a contract with Makandal. We decided to stage a Ceremony for Danbala, the divine serpent and origin of life in Haitian Vodou. Sure enough, Richard lost sight of the green van en route, and we arrived in the Altschul Auditorium of IAB only ten strong. But ten performers were adequate for the task. Photographer Chantal Regnault came to capture shots on stage, including those you see here. The photos show Frisner Augustin, Gesner Désir, Smith Destin, Jean Paul Joseph, Jocelyne Louis, and drumming students Kathy Jackson, Jane Tomkiewcz, and me. (I would guess that Makandal regulars Carole Jean Louis and Anthony Cyprien were driving around in the rain with Luc Richard.) We opened the program with a choreographed demonstration of yanvalou, Danbala’s dance, then segued into Vodou rites. The performance featured possession, not only by Danbala but also by the warrior spirit Ogou, who quaffs hard rum and wields a machete. One photo shows Ogou taking possession of Jocelyne Louis. Was it real? 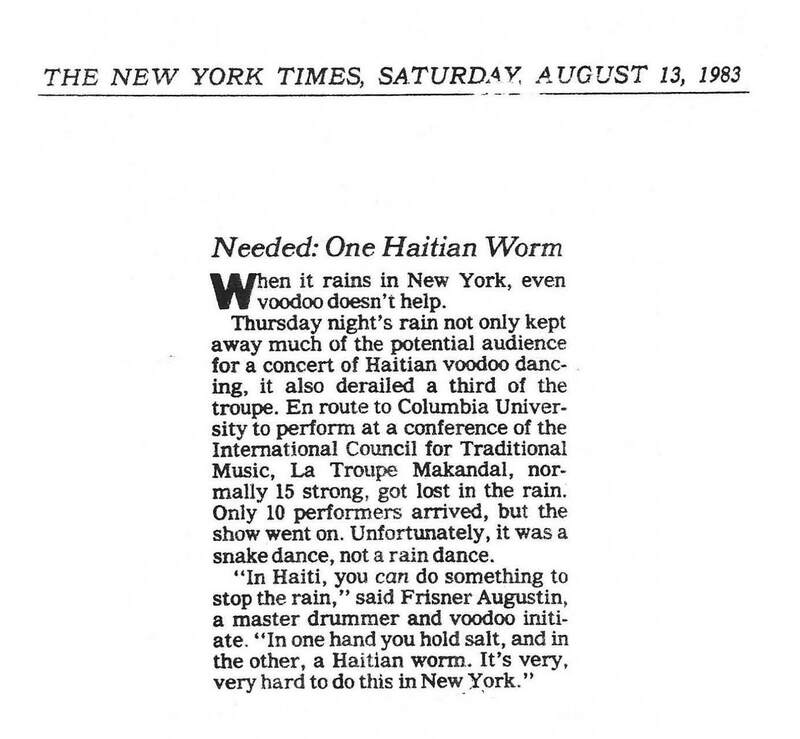 Despite the absence of one Haitian worm, the show went on, one among many dozens that Frisner and Makandal served up over the years. Each is a story waiting to be told. Help us tell these stories by supporting the Frisner Augustin Memorial Archive. Until next week! 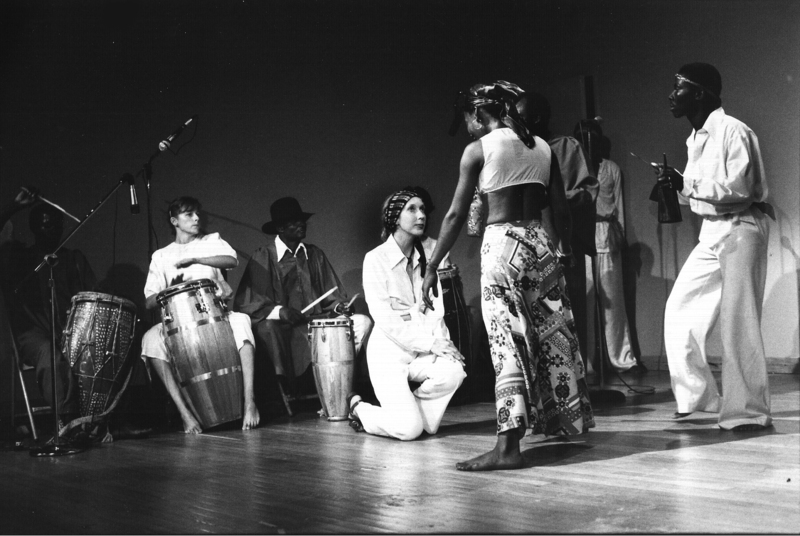 Photo by Chantal Regnault (second paragraph above): Frisner Augustin brings the spirit to Jocelyne Louis at a Makandal performance at Columbia University, New York, August 11, 1983. 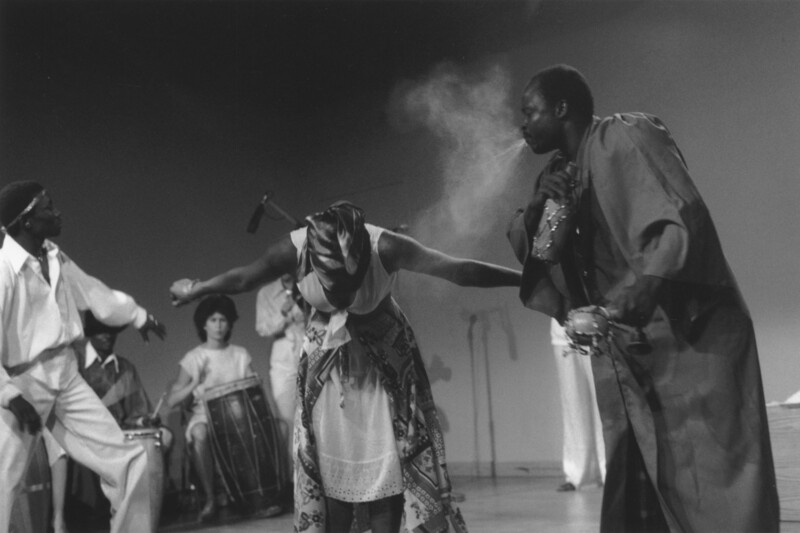 Photo by Chantal Regnault (third paragraph above): Lois Wilcken kneels before the spirit Ogou in a Makandal performance at Columbia University, New York, August 11, 1983.